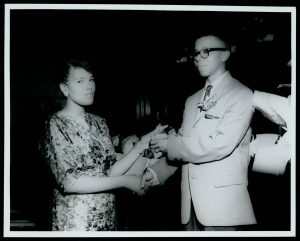 Eldrewey Stearns presents an award to fellow activist Holly Hogrobrooks in 1961 for her efforts in the civil rights movement.. Photo courtesy of the Thomas Cole Collection,Houston History Archives Special Collections, University of Houston Libraries. In the late 1950s and early 1960s young people in Oklahoma, North Carolina, and Tennessee held sit-ins that caught the eye of Texas Southern University (TSU) students in Houston. A growing disconnect existed between the younger generation and their elders on how to assert their rights as citizens. Those in Houston who remembered the horrific events in 1917 when violence erupted between white residents and African American soldiers guarding Camp Logan had no desire to see that repeated. Parents and grandparents told their children to wait, mind their own business, and focus on their education. The students chose to employ methods of peaceful protest preached by Dr. Martin Luther King Jr. Eldrewey Stearns was twenty-eight years old when Houston’s student civil rights movement began. Below, watch a film by author Michael Anderson created for the Houston History Class. Interested in learning more? Here is a link to the finding aid for the Thomas R. Cole Desegregation Papers. Also, you can view the Foley’s Department Store Records here. For more information on the documentary film Strange Demise of Jim Crow, or to purchase it, click here. The Houston Public Library’s Oral History Project conducted interviews with both Quentin Mease and Reverend Bill Lawson. TSU issued a statement following the death of Holly Hogrobrooks and details her accomplishments. The Houston Chronicle also published an article and photo set about Holly.